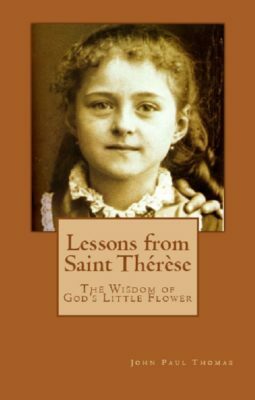 Lesson: As a child, Thérèse was like a sponge waiting to soak up all she perceived. Fortunately, she was surrounded with wonderful influences from the earliest age. Her sister Pauline, one of the most influential persons in her life, used to teach Thérèse about faith in many ways. One such way was through the use of holy pictures. I owe some of the happiest and strongest impressions which have encouraged me in the practice of virtue to the beautiful pictures Pauline used to show me. Everything was forgotten while looking at them. 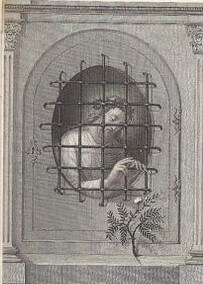 One image that affected Thérèse profoundly was the image of “The Little Flower of the Divine Prisoner.” In this image, Jesus is depicted as a prisoner, looking out of His cell through a barred window at a single white flower placed on the ledge of the window. The prison was meant to depict the Tabernacle containing the divine presence of our Lord. The little white flower was to depict the consolation given to Jesus every time He was visited in the Tabernacle. Thérèse spent much time meditating upon this image, “gazing at it in a kind of ecstasy.” Through her meditation, Thérèse grew in a desire to be that “Little Flower” outside the cell of Jesus, consoling Him in His imprisoned state. I offered myself to Our Lord to be His Little Flower; I longed to console Him, to draw as near as possible to the Tabernacle, to be looked on, cared for, and gathered by Him. It was this image that stood out to Thérèse above all because it was a clear depiction of the vocation she was called to embrace. She would one day enter the “prison” of the Carmelite convent and would be locked behind the grate with other holy nuns. Within this prison of love, she would be that Little Flower who consoled the Heart of Jesus by her love and adoration. Reflection: You, too, are called to console the Heart of Jesus as He remains imprisoned within the Tabernacle and in so many other hidden ways. When you are at church, before the Tabernacle, do you make acts of love so as to console our Lord? The simplest act of love would be to kneel before the Tabernacle and say to our Lord, “I love You.” Doing so will allow you to be another little flower offered to Him by your faith. Seek to find Jesus in your midst. Find Him, love Him, adore and console Him. In doing so, you will also participate in the beautiful vocation of Saint Thérèse, God’s Little Flower. Dearest Saint Thérèse, God’s Little Flower, you discovered your vocation to console the Heart of Jesus and you embraced it with all your heart. Pray for me, that I may imitate you and continue this beautiful vocation you were given. May I discover the Divine Prisoner all around me and love Him with all my heart. Saint Thérèse, pray for us. Lesson: As Sister Thérèse reflected upon her childhood and upon her time as a Carmelite nun, she continually sensed that one day she would be a great saint. She was aware of the fact that this sense may appear to be rash, since she knew she was far from perfect. Nonetheless, she stated clearly that she believed God would do this by His grace and not by her own effort. It is He alone, Who, pleased with my feeble efforts, will raise me to Himself, and, by clothing me with His merits, make me a Saint. As a child, Thérèse enjoyed reading as her favorite pastime. She read about Joan of Arc and other venerable heroines of France as well as many other books chosen for her by her sisters. As she reflected upon the lives of those about whom she read, and how they were admired by many, she understood that her greatness would be different. Her greatness would be hidden during her life, even from her own eyes. It was this hiddenness that Sister Thérèse acknowledged as one of the greatest graces she received in life. Though she is now venerated as a great saint and her soul is on display through her writings for all to see, she was formed and nurtured in the secrecy of her heart, and it was within this interior sanctuary that God created so many beautiful virtues. We are all called to become great saints, but we achieve this goal in varied ways. The virtues of some will be visible far and wide during their lives on earth. Others are called to greatness in a far more silent way, their virtue seen primarily by God. But in Heaven, the greatness of each saint will be manifest, and all will rejoice in the beautiful virtues bestowed on each by God. Reflection: Do you want to become a great saint? The first step in becoming one is to desire it with all your heart. The next step is to begin walking down the path of virtue, allowing God to transform your soul into the saint you are to become. Ponder your call to sanctity and know that it is a goal that you can achieve. Let God decide the path for your life and seek to discover it every day. Do not covet the holiness of others or envy the vocation they have been given. Seek only the path chosen for you and resolutely determine to journey down that path toward Heaven. Dearest Saint Thérèse, God formed greatness in you in a hidden way. You lived a quiet life with your family and continued that solitude within the walls of the Carmelite convent. But in your hiddenness, great things were taking place within your soul. Pray for me, that I may seek only the path of holiness God has laid out before me. May I become a great saint and rejoice in that fact forever in Heaven. Saint Thérèse, pray for us. She discovered that part of her was attracted to all this attention and that many people seemed to live for this form of charm that the world offers. At ten years of age the heart is easily fascinated, and I confess that in my case this kind of life had its charms. Alas! the world knows well how to combine its pleasures with the service of God. But Thérèse did not allow herself to become seduced by worldly “joys” and realized that these pleasures were passing, not eternal. The compliments, small talk, pleasures, worldly esteem and earthly successes were superficial and deceptive when made an end in themselves. Thérèse understood that Heaven is the only joy to seek in life and the only satisfaction that is eternal. Reflection: How attracted are you to worldly seductions? The world’s charms existed before TV and mass media culture, as Thérèse realized even as a child. Moreover, advertisements, TV shows and other forms of communication today present to us subtle but very influential images of what true happiness is all about. It is difficult to remain free of these many influences and charms and to keep our eyes on the true joys given to us by God. Ponder your desires and attraction to worldly success, praise, admiration and the like. If you are successful, praised or admired in the world, this is fine. But desiring these superficial charms and making them the “joys” that you live for is dangerous. Seek the joys and rewards of Heaven alone. Making this choice is a choice you will never regret. Dearest Saint Thérèse, you had your eyes fixed on Heaven and understood that Heaven was the only source of eternal joy. You did not allow yourself to become seduced by the passing pleasures of this world, choosing instead the pleasures that were eternal. Pray for me, that I may also keep my eyes on the one joy that matters in life. May I do the will of God in all things and find joy in this alone. Saint Thérèse, pray for us. Lesson: Little Thérèse received her First Holy Communion on May 8, 1884 at the age of eleven. She had hoped to receive it a year earlier but missed the age requirement by only a few days. She sought a dispensation but was not able to receive it. So she waited. The three months prior to Thérèse’s First Communion were filled with preparation in the most beautiful, thoughtful, meticulous and prayerful of ways. Her preparation became a mission engaged in by her whole family, especially her sisters Pauline and Marie. Her preparations were lovingly recorded in many letters written during those three months, especially letters written by her second mother, Pauline, who was now Sister Agnes of Jesus. I shall always remember my First Communion Day as one of unclouded happiness. It seems to me that I could not have been better prepared. Do you remember, dear Mother, the charming little book you gave me three months before the great day? I found in it a helpful method which prepared me gradually and thoroughly. I had Marie, too, who took Pauline’s place. Every evening I spent a long time with her, listening eagerly to all she said. How delightfully she talked to me! I felt myself set on fire by her noble, generous spirit. Thérèse understood well the importance of her First Holy Communion and did not squander her time in preparation for this most precious gift. Her preparation paid off and her First Communion day was one filled with the greatest blessings. Reflection: Even if it has been many years since you made your First Communion, do you remember it? Who helped you prepare to receive Jesus in the Most Holy Sacrament of the Eucharist? Did you feel well-prepared to receive him? What was special about that day? Preparation for First Communion is really preparation for every Communion we receive. Our preparation must be ongoing. Ponder the question from this perspective: How well do you prepare your soul for the ongoing gift of Jesus in this glorious Sacrament? Do you regularly ponder the reality of God coming to you in this hidden, mysterious and profound way? Do you pray, meditate, make sacrifices and confess your sins regularly so that every Communion you receive is as if it were your first? Ponder, this day, the three months of intense spiritual preparation Thérèse engaged in with the help of her family and seek to imitate her desire to make her soul the most beautiful garden in which her little Jesus would plant the seeds of His Body, Blood, Soul and Divinity. Never cease preparing yourself for this glorious gift and do not fail to understand its importance. Dearest Saint Thérèse, you lovingly prepared for the most glorious gift of the Precious Body and Blood of your Savior. You opened yourself to the many lessons your sisters taught you so that you could become a suitable dwelling place of your little Jesus. Pray for me, that I may continually prepare my soul for this precious gift every time I attend Mass and receive Holy Communion. May I imitate your preparedness and receive the same transforming graces you received. Saint Thérèse, pray for us. Lesson: After three months of preparation, the day of her First Communion was almost here. She spent the last few days at an abbey for retreat and continued her loving preparation. She received final instructions, listened attentively to the lessons taught by the priest, and prayed fervently as the great day arrived. How sweet was the first embrace of Jesus! It was indeed an embrace of love. I felt that I was loved, and I said: “I love Thee, and I give myself to Thee for ever.” …That day our meeting was more than simple recognition, it was perfect union. We were no longer two. Thérèse had disappeared like a drop of water lost in the immensity of the ocean; Jesus alone remained—He was the Master, the King! Upon receiving Holy Communion, Thérèse broke down in tears. As she cried, her friends did not understand. They wondered if Thérèse was sad that her mother was not there or if she had something for which she felt guilty. They did not realize how deeply she and her little Jesus loved each other and how deeply He transformed her precious soul. Night came, and so ended that beautiful day. Even the brightest days are followed by darkness; one alone will know no setting, the day of the First and Eternal Communion in our true Home. Somehow the next day seemed sorrowful. The pretty clothes and the presents I had received could not satisfy me. Henceforth Our Lord alone could fill my heart, and all I longed for was the blissful moment when I should receive Him again. Reflection: Few people have prepared so well, and loved Jesus so deeply, so as to enter into perfect union with Jesus as they receive Him in Holy Communion. This “divine fusion” as it has also been called must become the central goal of all of our lives. How deeply have you entered into union with our Lord when you received Him in Holy Communion? Thérèse’s experience of oneness with Jesus, being as a single drop of water that is plunged into a mighty ocean, is what we will experience forever in Heaven. If you are willing, God wants you to begin this oneness now. Reflect upon this powerful imagery from a little child. Allow her experience, including her tears, to teach you and to inspire you to allow your reception of this glorious Sacrament to transform your life. Dearest Saint Thérèse, you were overwhelmed and filled with the utmost joy as your precious Jesus entered your soul in the Blessed Sacrament for the very first time. Pray for me, that I may learn from what you experienced and seek to embrace Him ever more deeply in my life. May the Most Blessed Sacrament, our Divine Lord Himself, always find the perfect home within my soul. May Jesus and I truly become one. Saint Thérèse, pray for us. Lesson: After her First Communion, Thérèse longed to receive Jesus again and again. She made her second Communion on Ascension Day, kneeling between her father and Marie. Once again, she broke down in tears as she prayed fervently, uniting her soul with her Jesus in perfect union. I kept repeating those words of St. Paul: “I live now, not I; but Christ liveth in me.” After this second visit of Our Lord I longed for nothing else but to receive Him. In those days, Holy Communion was reserved for very special feasts. Thérèse would look forward to each feast day, and her sister Marie would always prepare her the night before so that she was ready each time she received Jesus in the Sacred Host. Thérèse lived on a different level than most girls her age. Her depth and insights into the divine mysteries were beyond what the normal human mind can fathom. Little by little, her precious Jesus, who now regularly came to her in Holy Communion, began to teach her and to guide her down the road of permanent union. Thérèse also began to discover that this road led to the sufferings of Jesus’ holy Cross. Reflection: Have you ever had the experience of Jesus living within you? Do the words Thérèse prayed in imitation of Saint Paul: “I live now, not I; but Christ liveth in me,” ever resound within your own heart? Reflect, today, upon the invitation God gives you to become deeply united with Him through prayer and the Sacraments, so that you, like Thérèse, will speak those words naturally and easily. Divine union is the sole purpose of life and must become your singular focus in life. Dearest Saint Thérèse, you were in awe of Jesus as you received Him in Holy Communion time and time again. He continued to transform you and to lead you down the road that He walked. Pray for me, that I may seek to walk the same road of sanctity and will be perfectly united to Jesus now and for eternity. Saint Thérèse, pray for us. Lesson: Early on, Thérèse grew in a desire for suffering and longed to embrace all suffering as a sacrifice made with love. Holy Communion nourished this desire within her soul, and she began to have great consolation at the thought of it, even if she did not yet understand how much she would suffer. Soon after her First Communion, Thérèse began preparing for the full outpouring of the Holy Spirit in the Sacrament of Confirmation. She prepared beautifully, just as she did for her First Communion. When the day came, she was given a special gift that would help her fulfill her vocation of suffering. I did not feel the mighty wind of the first Pentecost, but rather the gentle breeze which the prophet Elias heard on Mount Horeb. On that day I received the gift of fortitude in suffering—a gift I needed sorely, for the martyrdom of my soul was soon to begin. In those days, Thérèse did not suffer much. Even then, Jesus was preparing her for the day when she would cry out on her deathbed, “Oh! It’s pure suffering because there are no consolations! No, not one!…No, I would never have believed that one could suffer so much…Never! Never!” But for now, this little queen began to grow in virtue and wisdom so that she could one day follow her Lord to Calvary. Reflection: Ponder, today, the apparent contradiction of union with Christ and suffering. They go hand in hand while on this Earth because it was suffering that God used to redeem the world. This is no easy lesson to learn! Just as little Thérèse began to gain spiritual insight into the joy of suffering, seek to discover this same spiritual mystery. Seek to discover Christ on the Cross and know that through your communion with Him, He will use your suffering to transform your life. Pray, also, for the gift of Fortitude so that you, like Thérèse, will be able to endure the Cross with Christ. Saint Thérèse, it was through the Sacraments of Holy Communion and Confirmation that you began to discover the mystery of suffering and your martyrdom. Pray for me, that I may also understand the suffering I endure and may come to see it as a glorious means to Heaven. May I receive the same gift of fortitude that you received and carry my cross with courage and strength. Saint Thérèse, pray for us. Lesson: After Thérèse received First Communion and Confirmation, she returned to her day school at the Abbey and resumed her lessons. She excelled in catechism class but struggled with other subjects. On the playground, Thérèse attempted to forge new friendships with little success. She did make friends with two girls but found that these friendships were not very fulfilling. One of them had to stay at home for some months; while she was away I thought about her very often, and on her return I showed how pleased I was. However, all I got was a glance of indifference—my friendship was not appreciated. I felt this very keenly, and I no longer sought an affection which had proved so inconstant. Nevertheless I still love my little school friend, and continue to pray for her, for God has given me a faithful heart, and when once I love, I love for ever. It’s not that the other girls at school were different, it was that Thérèse was different. She knew what it meant to love and be loved to a profound degree. She not only enjoyed the deepest of love as it was expressed within her family, she also knew what it was like to be perfectly in love with God. Her heart was so well formed that, try as she may, she could not find this depth of love among her classmates. Reflection: How deeply have you loved and been loved by another? We certainly must love God with all our might, and God unquestionably loves us with a perfect love. But we do not always allow that love to consume us so that we can understand the depth of His love. As for the love of others, what a gift it is to discover a soul who loves you with the deepest and most holy love! Reflect upon your own experience of love. Start with the love of God. After you ponder the love you give and receive from God, look also at your human relationships. Are they more superficial and shallow, or have you been blessed with true friends with whom your heart has been deeply united? Thérèse and her sisters, when they were apart from each other, would write many letters. They always ended their letters by saying, “I love you and I kiss you with all my heart.” And they meant it. Pray that you may also be blessed to know such holy love. Dearest Saint Thérèse, you, your sisters and your parents shared a bond of love that few others know. It was a bond of selfless and pure love centered in the love of God. Pray for me, that I may know how to lavish love upon others with all my heart. Pray that God will send true friends into my life, that I may know of His love and affection through them. Saint Thérèse, pray for us. Lesson: Thérèse had much admiration for saints such as Saint Mary Magdalene who, though grave sinners, manifested great repentance in their lives. She often heard it said that grave sinners who repented loved God more than those who never lost their baptismal innocence. Thérèse firmly disagreed with those words! She realized, at an early age, that the Father had been so merciful to her that He preserved her from falling into grave sin. When she made a general confession to her spiritual director at age fifteen, the priest told her that she had never committed a mortal sin. Thérèse continued in a state of grace throughout her life. But she knew this was not to her merit. She knew that this grace, which preserved her from grave sin, was on account of God’s mercy. As a result, Thérèse was even more grateful to God and loved Him with a greater love than some who had been forgiven much. It was her realization of what she was preserved from that compelled her to such gratitude and love of God. Reflection: It’s true that those who have been forgiven much are often filled with gratitude for the forgiveness they have received. But do we have to wait until we fall into sin and repent to be filled with gratitude and love of God? Look into your own heart and ponder how grateful you are to God for His mercy. If you find that your love and gratitude are, at best, lukewarm, ponder why. Most likely it is because you have not properly understood how much God has done in your life. Don’t wait until you need forgiveness to be grateful to God. Like Thérèse, discover how much God has already done for you and from how much He has preserved you. Only by understanding this truth will you be able to grow in gratitude and love of Him who is Love and Mercy itself. Dearest Saint Thérèse, though you were never in need of the mercy given to those who sin mortally, you were nonetheless aware of how abundantly merciful God had been to you. By preserving you from grave sin, God forgave you everything! Pray for me, that I may understand how much God has done for me. May I never lack gratitude and grow daily in greater love of our glorious God. Saint Thérèse, pray for us. Lesson: Thérèse was not perfect. Though she had never fallen into mortal sin, she did struggle with a serious case of scruples. It was during the retreat before my second Communion that I was attacked by the terrible disease of scruples. One must have passed through this martyrdom to understand it. It would be quite impossible for me to tell you what I suffered for nearly two years. Scruples is a spiritual struggle in which a person becomes obsessed with sin and one’s own perceived moral failings to a dangerous degree. Some psychologists identify this moral struggle as a spiritual form of Obsessive Compulsive Disorder. Those who struggle with scruples cannot look at their sins clearly, in the light of God’s mercy. Every perceived weakness or sin is magnified and becomes a terrible burden, causing anxiety and fear. Eventually, Thérèse’s scruples made her so sick that she had to leave school at the age of thirteen. Her extremely sensitive nature and her desire for perfection began to confuse her thinking and she would cry every time she was aware of the least imperfection. During this period of almost two years, Thérèse continually poured out her soul to her sister Marie who listened to her with much patience. Marie became her earthly confidant and guide through this dark struggle. However, before this struggle with scruples was ended, Marie entered Carmel, and Thérèse no longer had anyone on Earth to whom she could pour out her heart. Therefore, she began to speak to her four little siblings who were in Heaven. Thérèse confided everything to these “little angels’” and their prayers for Thérèse were eventually answered. Thérèse began to find freedom from her scruples as she came to understand how much these four little angels loved her from Heaven and prayed for her. Reflection: Do you struggle with scruples? It seems that most people struggle not with scrupulosity but with a dull conscience and fail to see their sin as God sees it. For those who do struggle with scrupulosity, their cross is difficult to bear. Scrupulosity is a failure to see sin in the light of God’s perfect mercy. We are all sinful, and for that reason, we are all offered the unfathomable gift of the mercy of God. God is most generous with His mercy, and we must acknowledge that mercy as we acknowledge our sins. Reflect upon how clearly you see your sin in the light of God’s mercy, and know that God loves you with a perfect love. Seeing your sin in this way will not weigh you down. Rather, it will enable you to be freed of your sin and to rejoice in the goodness of God. Dearest Saint Thérèse, you carried a heavy burden of scrupulosity for almost two years. With time and grace, you were freed from this struggle and began to understand God’s love for you in a new light. Pray for me, that I may always see my sin clearly and that I may also understand God’s perfect mercy. May I open my heart to that mercy and overcome my sin with confidence and courage. Saint Thérèse, pray for us.